Eagan firefighters feared an explosion when they arrived at the scene of a 500-barrel gasoline spill near Thomas Lake Jan. 8, the city's fire chief told city councilors during a discussion of the event. Firefighters initially thought they were responding to a routine report of a gas leak, according to Scott. Such leaks or reports of the smell of gas are not uncommon at construction sites. When firefighters arrived at the Thomas Center Drive parking lot where a crew taking soil borings had struck a pipeline, they discovered it was, instead, a gasoline spill, with thousands of gallons of gasoline rapidly pouring onto the ground. The health club and another business at the site were evacuated, Scott said. Emergency responders began checking for explosive levels of gas in the air. They found none. The strip mall across the street appeared to be safe and was not evacuated. As Scott and Eagan Police Chief James McDonald described the spill, it appeared that Eagan got lucky. A stray burning ember or carelessly tossed cigarette or less ice on nearby Thomas Lake could have brought catastrophe to an area surrounded by residential neighborhoods and an elementary school. “I’m told we’re fortunate it wasn’t more than a spill,” Mayor Mike Maguire said at the start of the discussion. “When you have a river of gasoline coming down a parking lot going out into a city street, you don’t want an ignition source,” Scott said. The spill occurred after a contractor conducting soil borings for a parking lot expansion, STS Enterprises, struck a gasoline pipeline operated by Magellan Partners. Scott praised Magellan for their response. The company sent major resources, including more than 100 workers, to the scene quickly. Thirty-seven thousand gallons of gasoline and water and 67 trucks full of contaminated soil were removed from the area. “If you went down there now, you wouldn’t know there was a major event down there,” Eagan Police Chief James McDonald told the city council. City officials are awaiting Magellan’s long-term pollution monitoring plan, which they expect to receive Friday. Magellan has said it will reimburse the city for the cost of the emergency response. An investigation by the state’s pipeline safety office is continuing. Eagan Police Chief James McDonald and Fire Chief Mike Scott discuss the Jan. 8 Thomas Lake Center Drive gas spill with city councilors. Despite a shortage of police officers that prompted a 5 percent city tax hike, the Eagan City Council Tuesday approved an agreement to lend Eagan police officers to the city of Bloomington for Super Bowl related events. The agreement was approved as part of the city council’s consent agenda, where a list of items are approved summarily with a single vote without debate or discussion of individual items. The agreement does not list specific events to be covered by Eagan police. The two teams competing in the Super Bowl are slated to stay in Bloomington hotels. In a recent plea to the city council to hire more police officers, Eagan Police Chief James McDonald told the council the department was stretched thin by the demands of development in the city, including the new Vikings headquarters and the outlet mall, which generates a large number of calls to police. 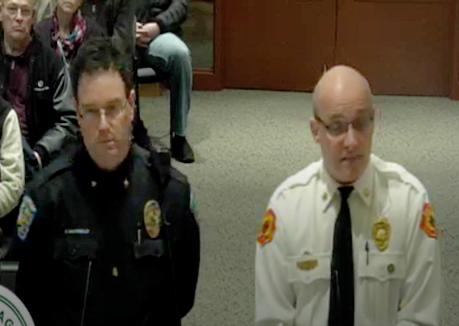 There was no discussion at Tuesday’s meeting, nor questions from the city council, as to how sending Eagan police to Bloomington would affect the Eagan police department’s staffing levels or emergency response. The project that nearly caused an explosion is scheduled to go before the Advisory Planning Commission for review this week. Lifetime Fitness is seeking approval of a 9,500-square-foot expansion to its Thomas Center Drive health club. The proposed expansion would eliminate 37 parking spots at a facility where members already have trouble finding parking spots during peak gym hours. The city’s Advisory Planning Commission is scheduled to review the proposal Jan. 23. A contractor was taking soil borings from the proposed site Jan. 8 when it struck a Magellan Partners gasoline pipeline, causing 21,000 gallons of gasoline to spill across the parking lot and into storm sewers and retention ponds. The Minnesota Vikings won’t be Super Bowl champions when they move into their Eagan headquarters. The team’s season ended Jan. 21 with a 38-7 NFC championship loss to the Philadelphia Eagles. The Eagles will face the New England Patriots in the Super Bowl. The Eagan City Council Tuesday night selected a Burnsville-based weekly newspaper as its official newspaper, the newspaper that will run the city’s legal notices, requests for bids, and whatever else the city wants to pay to publish. The newspaper will charge the city $8.50 per column inch. The city rejected a lower bid of $6 per column inch from a daily newspaper, reasoning it would not provide online access to the legal notices. The city also rejected a higher bid from a competing daily newspaper with a larger circulation on the grounds it was too expensive, although the city has run ads for the financially challenged Cascade Bay water park in that publication. The publication selected by the city is also the “official” newspaper of the District 196 school district. The publication charges the school system more than $10 per column inch to publish its legal notices. The Eagan Enterprise does not solicit or accept payments or discounts from the city government, school district, or government agencies. A Saint Paul woman is in jail based on allegations she took her 2-year-old from a foster care home. Mariana Torres Salas, 19, of 868 Westminster St. #3, St. Paul, was ordered to be held in Dakota County jail after being charged with felony deprivation of custodial/parental rights, according to court records. Police allege Salas took her child from a foster care home in South St. Paul shortly before 3 p.m. Jan. 12. Salas’ children had been placed in the foster home eight days earlier based on allegations of the mother’s drug use, court records said. The mother was not allowed visitation with the children, according to the criminal complaint. The foster children had been left with a babysitter at the time the child was taken from the home. The sitter had left the room to get a bottle for the child, according to court records. Salas told police the door was open when she arrived at the house. She saw the child near the door so she took the 2-year-old and left, according to a criminal complaint. Police found the mother and child in St. Paul, according to the complaint. The mother was holding the child on her lap when police arrived. Police searched a backpack at the house and allegedly found two glass bubble pipes with what appeared to be methamphetamine residue, according to a criminal complaint.